LA weather is just great for pictures. The sunny, warm weather and amazing backdrops are a blogger's dream. Don't get me wrong, I am a NY'er til the day I die, but summers in NYC can get soo humid that taking pictures becomes an epic task. There were so many times this summer that I just had to go back in the house after shooting and just sit in front of the air conditioner. Ok, I'm getting off topic...lol...back to the matter at hand. LA weather plus all the wall art- pure magic. A must have picture in your blogger files when visiting Los Angeles, is the Pink Wall in Downtown LA. Shooting at the Pink Wall was on my blogger bucket list so I'm happy that the IG Wives had a chance to go and shoot there with our amazing photographer Fabulizza. Check out her site, she is AH-MAZING!!!!! The big question was what can I wear that will look great against the iconic Pink Wall. I have been all about trying new silhouette's this year, and my next one to tackle was the halter top. 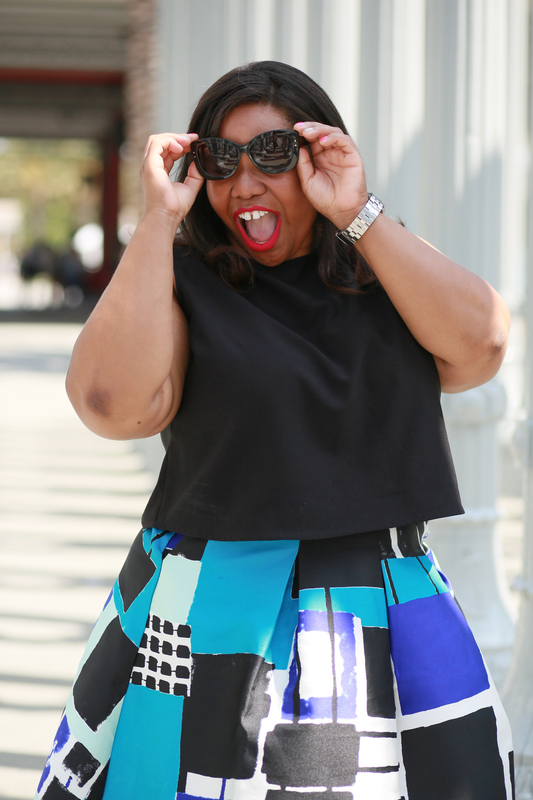 My go to brand for all things fun and trendy- Eloquii. I went with their Sleeveless Cross Front Top because in my latest tackle of new silhouette's I wanted to give a halter top a try. What I love about the top is that it gives the illusion of a halter in the front, but it still provides ample coverage in the back. Definite must have for those that are not about a halter due to the tying of the strings around your neck. Added bonus, this top is on sale, so I would check it out. I don't see this as just a top for the summer, I would wear this well into fall. Just throw on a blazer and you are all set. Frayed jeans are on trend this season, so when I saw this cropped version, I just had to have them. They have a good amount of stretch, and they do not feel heavy which is great for warm weather. I still will wear denim even when it's hot, but I always make sure that it's not a heavy denim. This is the best of both worlds because it's not as lightweight as chambray, but it's not as heavy as most denim. All that was left was some great accessories like this tie I made into a headband, and my favorite sunnies. This group shot of us is one of my favorites. You have me being somewhat silly, Darlene in full on fabulous posing mode, and Sandra looking effortlessly cool. The Wall was tackled by the IG Wives and I must say we look great rocking our favorite pieces from Eloquii. Stay tuned lovers for more of the IG Wives take LA!! !